- WWE Wrestlemania 21 (April 3, '05) = Akebono won a "Sumo" Match over the Big Show. - Wrestle-1 Sumo Hall (August 4, '05) = Akebono was pinned by the Great Muta. - Wrestle-1 Yoyogi National Stadium Gym (October 2, '05) = Akebono & Scorpio fell to Mitsuharu Misawa & Yoshinari Ogawa. - AJPW Unchained World (November 19, '05) = Akebono pinned Giant Bernard. - AJPW Real World Tag League '05 (November/December) = Akebono & Keiji Mutoh lost in the finals to Team 3-D.
- NJPW Tokyo Dome (January 4, '06) = Akebono & Yutaka Yoshie took down Hiro Saito & Black Strong Machine. - NOAH Budokan Hall (January 22, '06) = Akebono & Takeshi Rikio defeated Jun Izumida & Kenta Kobashi. - NJPW Sumo Hall (February 19, '06) = Akebono & Riki Choshu were beaten by Brock Lesnar & Shinsuke Nakamura. - NJPW Sumo Hall (March 19, '06) = Akebono lost to the IWGP Heavyweight Champion, Brock Lesnar. - K-1 Heroes 5 (May 3, '06) = Akebono was forced to submit in the 2nd round by Don Frye. - NJPW IWGP Heavyweight Title Tournament (July 17, '06) = Akebono beat Hiroyoshi Tenzan, then fell to Great Bernard. Hiroshi Tanahashi won the tournament. - NJPW G1 Climax Tag-Team League '06 (November/December) = Akebono & Riki Choshu competed in the league, which was won by Masahiro Chono & Shinsuke Nakamura. - K-1 Dynamite! '06 (December 31) = Akebono lost an "MMA" Match, in the first round, to Giant Silva. - AJPW Pro Wrestling Love in Ryogoku Vol. 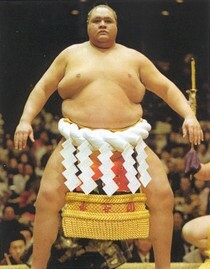 2 (February 17, '07) = Akebono & Touru Owashi defeated Johnny Dunn & Sumo Rikishi. - NJPW G1 Climax '07 (August) = Akebono competed in the league, which was won by Hiroshi Tanahashi. - NJPW Sumo Hall (August 11, '07) = Akebono pinned Hiroyoshi Tenzan. - NJPW Sumo Hall (August 12, '07) = Akebono, Masa Chono, & Giant Bernard defeated Manabu Nakanishi, Takashi Iizuka, & Naofumi Yamamoto. - Hustle 26 (September 22, '07) = Akebono took down Razor Ramon Real Gay. - NJPW Explosion '07 (October 8) = Akebono forced Milano Collection AT to submit. - NJPW Destruction '07 (November 11) = Bono Tiger (Akebono) & Tiger Mask IV defeated Tomoaki Honma & Tomohiro Ishii. - HustleMania '07 (November 25) = Akebono, Yoji Anjoh, & Yin-sama fell to Yoshihiro Tajiri, Genichiro Tenryu, & Razor Ramon Real Gay. - Hustle Matsuri '07 (December 31) = Akebono, Yin-sama, & the Great Muta won over Razor Ramon Real Gay, Yoshihiro Tajiri, & Genichiro Tenryu. - Hustle 27 (January 13, '08) = Akebono & Bob Sapp took down Wataru Sakata & Razor Ramon Hard Gay. - Hustle 28 (February 24, '08) = Akebono & Mark Hunt defeated Yoji Anjoh & Tiger Jet Singh. - Hustle 29 (March 20, '08) = Akebono was pinned by Bob Sapp. - Hustle 30 (April 13, '08) = Akebono & Yutaka Yoshie beat Yoji Anjoh & Giant Silva. - HustleAid '08 (May 25, '08) = Akebono took down Yinling. - HustleMania '08 (December 30) = Akebono & the Great Muta took down Toshiaki Kawada & "Toshiaki Kawada's Father". - Dragon Gate USA Bushido: Code of the Warrior (October 29, '10) = Akebono & Brodie Lee defeated The Osirian Portal. - Dragon Gate USA Freedom Fight '10 (October 30) = Akebono was beaten by Brodie Lee.